We are fortunate to live in a state that holds enormous potential for large-scale renewable energy production. From our long coastlines, to windswept hills and sunbaked deserts Western Australia is well placed to lead the world in renewable energy. 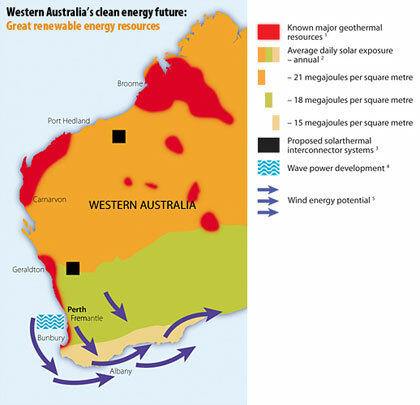 However, currently only 6% of all the energy consumed in Western Australia comes from renewable energy sources, with the remaining 94% coming from non-renewable sources (54% gas, 31% coal). WA's renewable energy resources could provide many times the amount of fossil-fuelled power currently used in the state. It isn’t surprising that improvements in technology and the increase in clean power generation in recent decades have made renewable energy more cost-competitive with fossil fuels. What is surprising however is how much the cost of renewable energy production has dropped in just a matter of years. Released in 2013 ‘Lazard’s Levelized Cost of Energy Analysis 7.0’ found that the levelised cost of electricity (LCOE) from wind and solar sources in America has fallen by more than 50% over the past four years. On top of this, poll after poll has shown that 80% of Australians support renewables. This means that there is no excuse for the Western Australian Government to continue to disregard renewables as having the potential as a main source of our energy. Wind power is the fastest growing large-scale renewable energy source in Australia. In Western Australia there are a number of large-scale wind farms. These include the Collgar wind farm, which powers 125,000 homes, and the Walkaway facility, which produces renewable energy equivalent to taking 76,000 cars off the road. To see a list of all the current wind farms in WA click here. Solar Energy in Western Australia is also growing. Australia’s first solar farm is under construction at Greenough River. The 150,000 advanced thin film Photo Voltaic modules will displace 25,000 tonnes greenhouse gas emissions every year, which is the equivalent of taking 5,000 cars off the road. The Australian Solar Council estimates that nearly 500,000 people have rooftop solar in WA (more than 150,000 homes), and this could double in the years to come. We can use renewable energy to fuel a sustainable mining boom and, in turn, use mine-site technology to tap our state’s vast renewable wind, solar and geothermal resources. The same drilling technology employed every day by mining companies could be used to harvest almost limitless geothermal energy form the Earth’s crust. Don’t forget that. We can build an economic future for Western Australia that is clean, strong and resilient to global turmoil. The best news is that work is already starting – people from all over WA area already doing their bit to reduce their impact on the environment, slash their bills and end the uncertainty about where new jobs will come from after the boom.